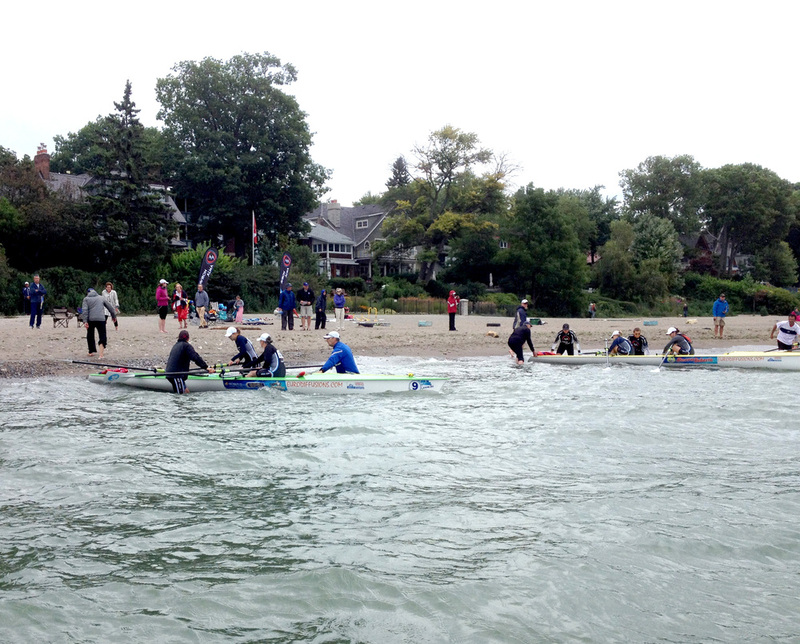 On Saturday August 16th, the coastal rowing crews from Ontario and the Lac St-Jean area of Quebec set camp on Balmy Beach in the east end of Toronto. The newly formed coastal rowers from Ontario were to compete against crews from Alma that brought in boats, expertise, a huge amount of enthusiasm and passion for this rowing discipline. A coastal rowing event had been germinating in Toronto rowers’ minds for over a year. Coastal Rowing vastly expends the ability to not only host regattas close to urban centers where the sport can be easily exposed to non-rowing crowds, it allows clubs located close to a large body of water a safe way to expand and run their rowing programs in rough waters. Thanks to Rowing Canada Aviron, creating a coastal rowing event was part of the plan that saw two coastal boats being hosted at Hanlan Boat Club of Toronto. With the strong support of ROWONTARIO, volunteers and the commitment of Hanlan Boat Club as the hosting club, the first coastal rowing event in Ontario was born on Saturday August 16th. The teams of volunteers gathered bright and early to lay down the 3 km triangular rowing course on a wavy Lake Ontario in front of the Silver Birch boathouse in Toronto’s east end. At 9 am, the long anticipation of successfully launching the first race from the beach was over. The first heat of the Mens Solo (single) race with H. Michaels (Durham RC), David Fisman (Hanlan BC), and S. Lavoie (CA Alma) pulled off the sheltered start area at the sound of the horn. The rowers completed the lap around the course to land on the beach and then run up and touch the flag pole to stop the clock. Meanwhile, the first heat of the Mens doubles was lining up at the start and soon was on its way through the waves of Lake Ontario. The morning was a succession of qualifying heats for Mens singles and doubles and Womens coxed quad finals. Two laps or 6km of the course were completed during the women coxed quad finals. A salad and sandwich lunch was served to all during the mid-day break, allowing crews to rest in preparation for the afternoon finals. Around noon, clouds started to move in and the wind picked up. The jury and organizing committee decided to shorten the distance of the afternoon finals to a single lap of the course in an attempt to get most of the races completed ahead of the oncoming bad weather. A while later, the uninvited rain decided to come and join our fun day at the beach. The waves grew taller as the winds got stronger. By the last race of the day, the Mens Coastal Coxed Quad, midway through the course the waves were roughly a meter and half high. These were not an issue for the coastal boats and both the Hanlan Boat Club and CA Alma crews enjoyed surfing in such long tall waves! <<C’est ça l’Aviron de Mer>> (That’s coastal rowing!) exclaimed Victor Dallaire, the bow seat of the Alma quad, as rowers shook hands to congratulate each other on the race we just completed. Needless to say that everyone had an absolute blast. While the cold wet weather made us shiver a bit, it hardly affected our enthusiasm. At 6pm, crews gathered by the fireplace (yes we did) at Murphy’s Law for the Medal Ceremony and a well-deserved, warming beverage. The organizers and the rowers would like to thank the safety team: David Cole, Michael Sasi, Hugh Fletcher, Bob Hedley, the Ashbridges Bay Yacht Club and the Pickering Auxiliary Rescue Association for their exceptional show of expertise in the rough water conditions. The Jury and our Chief Umpire William Donegan also received a huge round of applause from the rowers. This was a first event with rather difficult weather conditions but the ability of the jury, coaches, safety crew and organizers to keep the event running smoothly made it a very good day at the beach. * All photos courtesy of Petra U, Sarena Knapik and Mike Purcer.